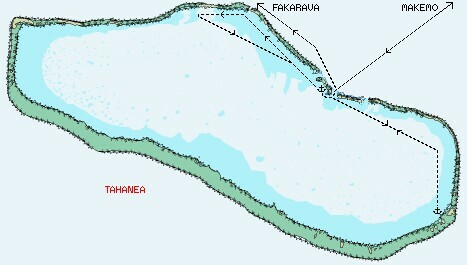 On Saturday, July 12, we went through the cut at the west end of Makemo Atoll and sailed for Tahanea, about 50 miles to the SE. The winds had lightened up enough to allow us to fly the chute and full main the whole way - a glorious sail, with sustained boat speeds of 8-9 knots! We arrived with a fair amount of current still flowing out the pass, so I was glad we have nice big diesel engines. Inside were several cruising friends and a big BBQ ashore under the almost full moon - a delightful welcome. Entering the pass at Tahanea on a rising tide. The next day we celebrated Sue and Fiona's birthdays ashore. The party itself was fun, with a treasure hunt for the 2 birthday girls, bocce ball competitions, hermit crab races, good food (we BBQ'd the last of our Makemo fish), good friends (about 8 boats), and much laughing and singing around the campfire, led by Amanda and Dan's guitars. Amanda practices often and is becoming quite accomplished. She's also much less shy about playing in front of others. Just as the moon was supposed to come up, we noticed that it wasn't. In fact, the stars were disappearing. We hastily put the fire out, picked everything up, and found our way across the motu to our dinghies. The wind had piped up smartly and there was a mad scramble to untangle dinghies in the rock-strewn shallows and get back to our boats. 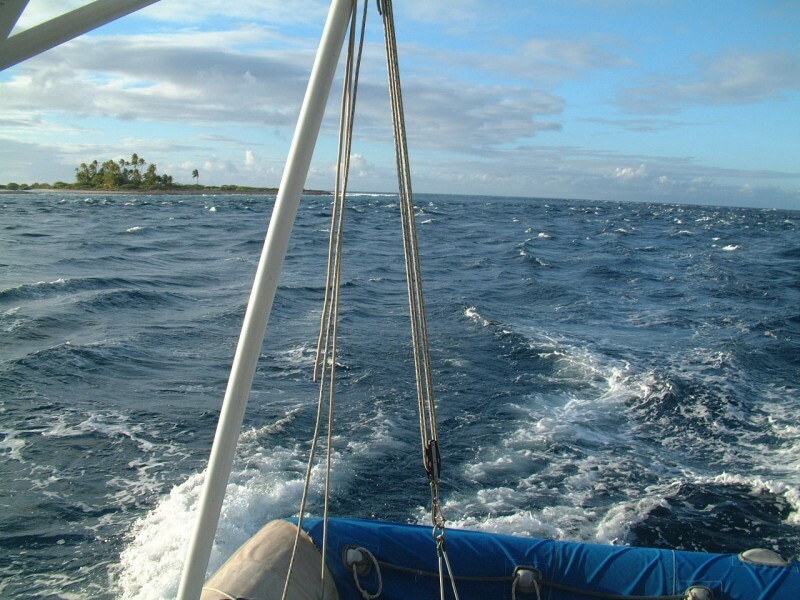 The wind had veered into the SE, bringing waves into the anchorage and tangling anchor lines in the coral and putting us all on a bit of a lee shore. In the end, Ocelot had an uncomfortable night, but other boats had more problems. One dinghy broke loose and had to be recovered, one boat smashed their bowsprit when their anchor chain caught under a coral head, and another boat first drenched their digital camera and then actually broke their anchor chain, forcing them to motor slowly around the anchorage for the rest of the night. The next morning Chris volunteered to dive on our anchor and found that it had wrapped itself through 270 degrees around several coral heads and was lying off our port side. These coral heads are often mushroom shaped and hard as concrete, so Chris stayed in the water to guide us as we gingerly picked up the anchor from around the coral heads. Thank goodness for the maneuverability of twin diesels! We bashed our way into the SE corner of Tahanea Atoll to give us protection from the strong SE winds, leading a parade of 4 other boats. We found a delightful anchorage in sand behind a palm lined motu in crystal clear water. Over the next several days we explored the motus in front of us and snorkeled the shallows. We even rigged up the sailing dinghy and tootled around the anchorage just for the fun of it. The barrier reef is about 50-400 yards thick, with islands and palm trees dotted along it. In between the islands there can be lagoons that reach in almost to the far (windward) side of the reef. These lagoons seem to be excellent fishing grounds so several of us tried our hands. The (sometimes huge) waves broke about 150' from us and flowed across the relatively flat barrier reef, spilling into the central lagoon. We stood at the edge of the lagoon, looking for holes the fish like to hide in. Sometimes, the clear water allowed us to see the fish themselves as they darted into their holes. We just used hand-lines, with a 4/0 hook and a big blob of raw fish (1-2"). I used a boat-hook to extend my reach a bit and to get the bait just where I wanted it. This also proved useful to extract the fish once they hit, as they immediately darted back into their holes, where they could be difficult to extract. These fish, mostly groupers and snappers, were amazingly stupid. If you didn't hook them right away, just put your bait back - they'll keep going for it. Dan (on Mariposa, another mad-keen fisherman who we first met in Bonaire) lost a hook to a nice grouper, so I went over and caught it for him, with Dan's bait and hook still stuck in the inside of his mouth, back by the gills. One problem was sharks. They're about 4' long and there were several of them. They have light green/yellow bodies with black fin tips. They were difficult to see so we lost several hooks to them. They hardly even made a jerk - just a twitch, I see the shark swim off, and there's nothing left but the line. 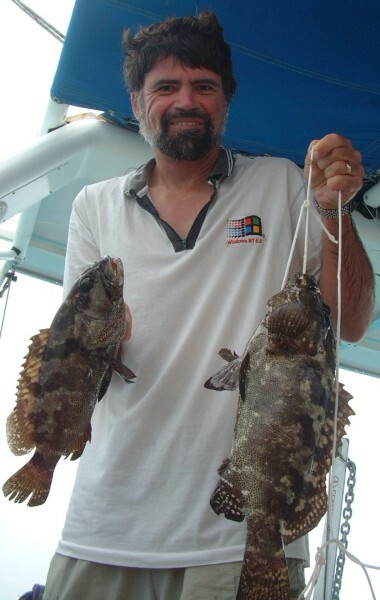 I even had a nice snapper, which I'd tied off with a line through mouth and gill, tied to a coral outcrop. I left the snapper in a 2" deep puddle just off a main stream but when I came back 10 minutes later, my 1/8" cord was cut off and the snapper was gone. Even so, I put several pounds of boneless fillets in the fridge in just a few days. A few days later we sailed back to the pass, preparing to leave Tahanea. Here we had yet another harrowing experience. We came out at night to hoist the dinghy in the davits (as we do every night) and found that it had drifted off sometime in the last 2 hours. We madly scrambled out in friends dinghies with powerful spotlights, but even though we went some 4 miles down the lagoon we couldn't find it. The night was absolutely black and the spray from the 20-30 knot winds limited the range of the spotlights, even when I stood up on the sides of the dinghy. 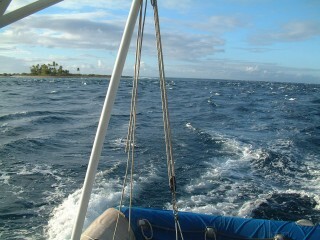 The trip back up the lagoon, bashing into swells was wet and grueling. I was sore for days just from trying to hang on. The next morning we took Sandra from Mariposa (and her dinghy) in Ocelot to search the inside of the lagoon. 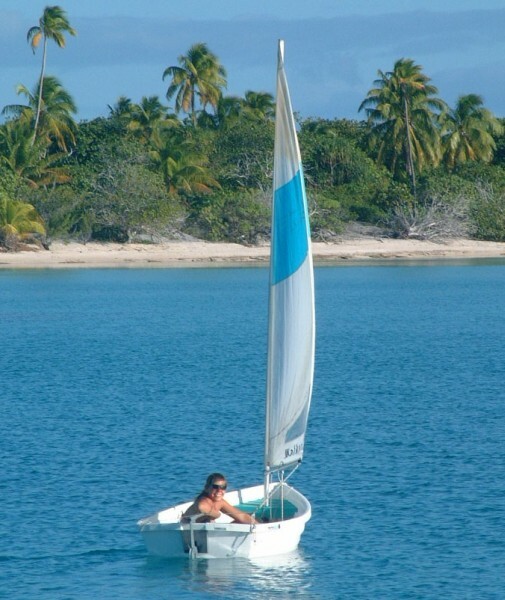 (If you have to lose a dinghy, it's best to do it inside an enclosed lagoon!) After about 2 hours we finally found it about 9 miles away, parked gently on the beach but half full of water from waves slapping the transom. Getting ashore through the 4' swells and breaking surf was a neat trick, but we found a small lagoon that made it a bit easier. We bailed out the dinghy and it appeared unharmed so I started her up and we motored both dinghies back through the surf to Ocelot. That night we hosted a party on Ocelot for the 2 other boats who had spent so much time, effort, and (hard to replace) dinghy fuel to help us. The cruising community has some wonderful folks. Click here to go the the Tahanea Destinations page.